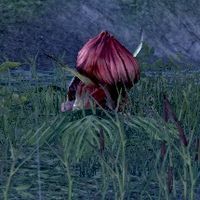 Stranglers are dangerous plantlike creatures found mainly in Valenwood and Shadowfen. Stranglers are rooted to the ground, and any abilities that knock back or pull targets will be ineffective on them. A basic ranged attack that does minor poison damage. The strangler will pull the player towards it. This ability is only used if the player is far away from the strangler. The strangler will drain the player's blood, dealing moderate physical damage over time. This attack can be interrupted to set the strangler off balance. The strangler sends out roots to lash at the player. This attack does moderate poison damage as indicated by a red circle. This page was last modified on 3 February 2019, at 08:08.